This year's typhoon season is finally over, leaving its terrible scars upon the Japanese archipelago. Among all the media coverage of the typhoons, one news story caught my eye: a team from Nagoya University flew an aircraft into the eye of a typhoon to perform observations. The US military used to observe typhoons by aircraft, but this ended in 1987. The Japanese weather satellite Himawari was launched in 1977, so for the ten-year period until the end of observation by US military aircraft, typhoons were observed both by plane and from space by satellite. In other words, there was the strictest monitoring system in the history of typhoon observation. I once wrote an article on the history of typhoon observation, and in the back of my mind I have always wondered whether stopping observation by aircraft had any effect on typhoon observation. The team from Meidai started observing typhoons by aircraft last year, so once again, typhoons are being observed both by plane and by satellite. But why Meidai? I had assumed only the US military would be brave enough to fly into the eye of a typhoon, so this news was quite unexpected. Entering the eye of Typhoon Lan last October. The towering wall of clouds around the eye, the vortex and the sea can be seen. 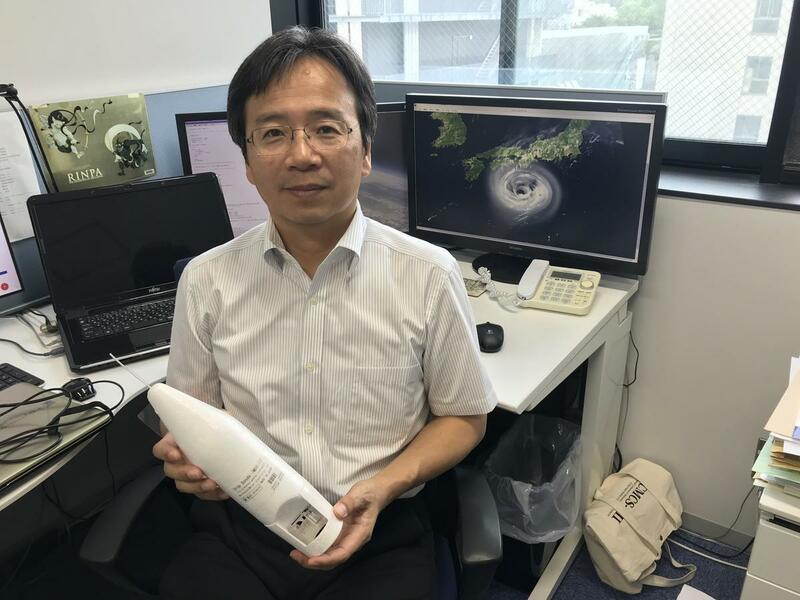 I spoke to Professor Kazuhisa Tsuboki of the Institute for Space-Earth Environmental Research at Nagoya University's Center for Integrated Data Science, who is leading the observation team. As I suspected, the intensity of a typhoon cannot be accurately measured by satellite observation alone, and there are problems in predicting large typhoons, so they decided to take on the challenge of direct observation by aircraft. Since 1987, observation by aircraft has been carried out only once, by Japan's Meteorological Research Institute in cooperation with the USA and other countries in 2008. I was amazed by one graph that Tsuboki showed me. This graph showed the annual trend in the number of severe typhoons exceeding wind speeds of 54 meters per second on the ground, as presented by the Japan Meteorological Agency (JMA) and the US Joint Typhoon Warning Center (JTWC), and the two results were completely different. The JTWC, based in Hawaii, was established jointly by the US Air Force and Navy, and is dedicated to issuing typhoon warnings. You might think that the number of typhoons should be about the same wherever they are observed from. However, from the 1990s onwards in particular, the American data shows about 6 to 7 severe typhoons per year, but the JMA data is completely different, showing about 1 per year. The intensity of a typhoon depends on the central air pressure and wind speed, but these cannot be directly measured from a satellite; they have to be estimated from patterns in cloud forms. However, there are limits to this, because the detailed cloud formations in a vertical direction cannot be observed in detail from the pictures. The result depends on the conversion table used to estimate the intensity, and there is a large margin of error, especially for strong typhoons. 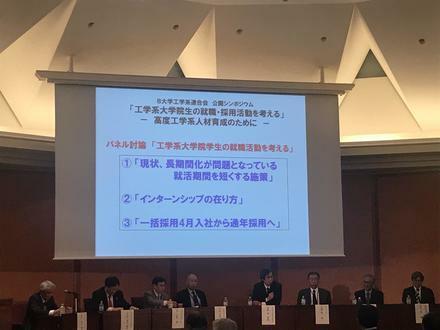 According to Tsuboki, the ability to predict the path of a typhoon is improving year by year, but there has been hardly any progress in the prediction of intensity over the past few decades, an issue which has been troubling meteorological organizations around the world. The only way to solve the problem would be direct observation. 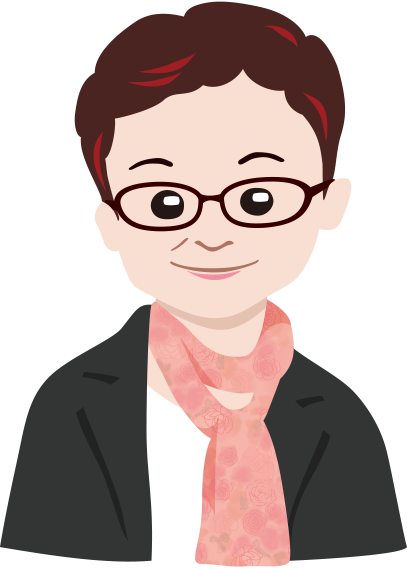 Tsuboki received a doctorate in meteorology from Hokkaido University, researching snow clouds in the Sea of Japan. In 1997 he moved to Meidai and continued his research into low-pressure weather systems. He was impressed by the power of the Japan Agency for Marine-Earth Science and Technology (JAMSTEC)'s Earth Simulator which started operating in 2002. Developed with the purpose of simulating climate change, the Earth Simulator became well known as the world's most powerful supercomputer at that time. With 100 to 1,000 times the capacity of conventional systems, it can calculate huge areas at high resolutions. Tsuboki wondered that he could and also should simulate typhoons, which can form cumulonimbus clouds up to 10 kilometers high and move over thousands of kilometers. Although typhoons cause huge devastation every year, they were only being researched by meteorological institutes, with hardly any research by universities. When he first looked at the data, it proved to be interesting. Then he came up against the variation in estimates of intensity. There was a debate over the conflicting results around 2012, with some studies showing an increase in the number of large typhoons, and others showing a decrease. The only way to settle the debate would be to take actual measurements at the strongest point of the typhoon. But the Meteorological Agency had budget issues, and researchers were not keen to use aircraft, so Tsuboki realized he would have to do it himself. 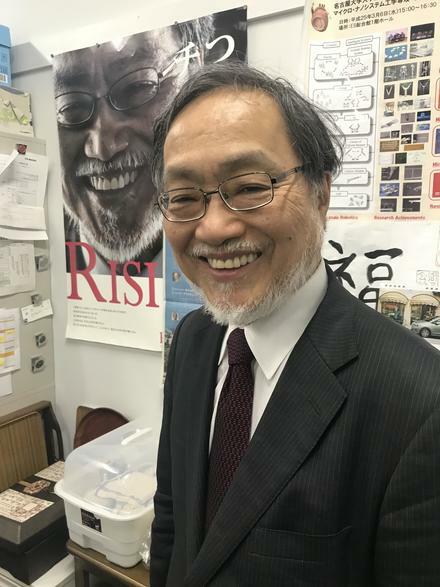 With cooperation from the University of the Ryukyus, where he had connections through typhoon research, and researchers from the Meteorological Research Institute, he decided to set up an aircraft observation project. He applied for large-scale research funding from MEXT, which was a tricky hurdle, but with some guidance from senior university colleagues and plenty of rehearsal of his presentation, he managed to get through the review process and the funding was granted. The first flight was on October 21, 2017. Typhoon Lan (Typhoon No. 21), classed as "very large and very strong" on the JMA scale and as a "super typhoon" on the JTWC scale, was approaching Japan. The team entered the eye of the typhoon at a latitude of 23 degrees north above the sea to the east of Miyakojima, and dropped 21 dropsondes from a height of several tens of kilometers. Dropsondes measure temperature, air pressure, humidity, wind direction and wind speed in the 15 minutes as they fall to the sea, and send the data to the aircraft by radio transmission. The following day the team observed the typhoon again, which had now moved to a latitude of 28 degrees north, near the Ogasawara Islands. They found that there was a difference of about 15 hectopascals from the JMA's estimate, a difference of 5-10 meters in terms of wind speed. In late September this year, they entered the eye of Typhoon Trami (Typhoon No. 24) and made observations by dropping a total of 63 dropsondes. 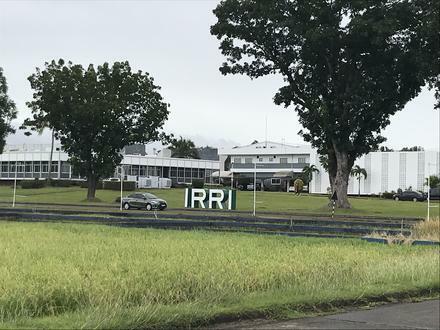 This time, the data was processed immediately and sent in real time to the JMA and meteorological agencies around the world in less than a minute. Despite the advances in the prediction of the path of typhoons, there are usually slight differences between different agencies, but after sending the data, the paths predicted by these agencies were almost the same. "The measurement data must have been useful in predicting the path of the typhoon," says Tsuboki. This shows the power of data from the storm's eye -- the very center of the typhoon. This was what researchers all over the world had been hoping for, and Tsuboki received e-mails from colleagues around the globe congratulating him on the successful observation. Entering the eye of a storm sounds like a terrifying idea, but what is it actually like? In fact, Tsuboki did not originally intend to go into the eye. 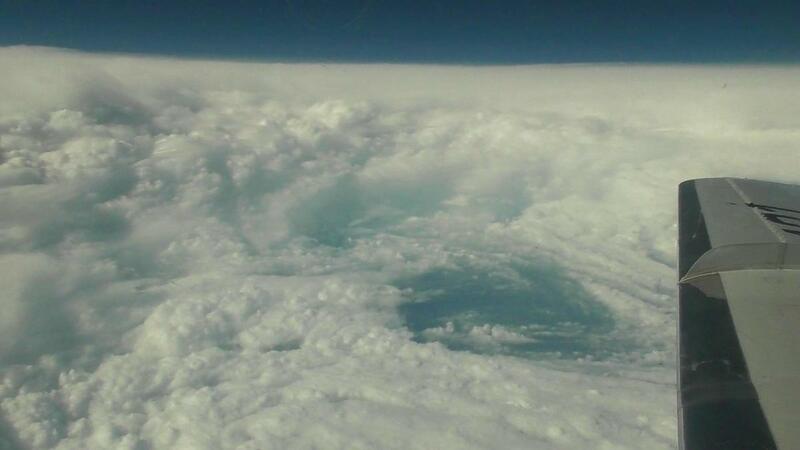 But while he was in the cabin, the pilot announced: "We're entering the eye now." He was shocked to hear this, but the pilot judged that it was safe to enter from the part of the wall of clouds where the rain was weak. At an altitude of about 14 kilometers, sweeping through a wall of pure white, the view suddenly cleared before his eyes. This was the moment a Japanese researcher entered the eye of a super typhoon in a Japanese aircraft for the first time. He could see the sea below, and the huge tower of clouds rising around them. The flight was quite smooth. "It was such a beautiful, impressive view, I got goose bumps," recalls Tsuboki. At the same time, he also felt a strong sense of awe, a feeling of entering a forbidden place. He has now entered the typhoon's eye three times last year and six times this year. One of the major achievements is the discovery that it is possible to enter the eye at any time, from any point if the pilot judges the entry timing and position correctly. "The eye can be observed at any time. A new world has opened up," says Tsuboki. Air travel has expanded our worldview, but in Japan there is still a strong psychological resistance to using aircraft. The Institute for Hydrospheric Atmospheric Sciences (now Hydrospheric Atmospheric Science Center) once wanted to have an aircraft here at Nagoya University, so perhaps we are comparatively more comfortable with aircraft. The aircraft industry also has sites nearby. The aircraft used for observation was a Gulfstream-II jet made by Diamond Air Service Inc., a subsidiary of Mitsubishi Heavy Industries, and it took off from Nagoya Airport. This project also involved another showpiece of proprietary development: instead of plastic, the dropsondes were made of a corn-based material. After sending the data they have measured, dropsondes fall into the ocean and become trash. Plastic pollution in our oceans has become a major issue, but corn decomposes, so it does not cause pollution. The corn dropsondes were jointly developed with Meisei Electric Co., Ltd., a manufacturer in Isezaki, Gunma specializing in meteorological measurement systems. Meisei Electric was the first company in Japan to develop sondes, which were mainly made in Northern Europe, and also improved the quality. Last year it became the first private company to be recognized by the Meteorological Society of Japan for its contribution to meteorology. The JMA drops around 10,000 sondes each year for observation, so hundreds of thousands must be used around the world each year. Tsuboki hopes that this will be the start of popularizing environmentally friendly biodegradable sondes. Tsuboki dreams that one day, uncrewed aircraft will constantly monitor typhoons above the Pacific from a height of 58,000 feet (about 17.7 km), dropping sondes as necessary, so that accurate forecasts can always be obtained for both the path and intensity of each typhoon. He believes that the university's role is to build up the basic research to make this a reality. Typhoons have frequently caused major devastation in the past few years. If global warming continues, it is believed that more typhoons will be formed at higher latitudes, and the position where they become strongest will move further north. In the second half of this century, the temperature of the seas around Japan will rise to approximately the present sea temperature around the Philippines. This will increase the possibility of strong typhoons striking Japan. Being able to accurately predict when and where a typhoon will land, and how strong it will be, will help to mitigate the damage caused. As a country prone to natural disasters, Japan needs to be prepared with such accurate prediction.